To understand the real importance of cryptocurrencies like Bitcoin you should first understand money. The only way to create real material wealth is to take raw materials, labour and knowledge and combine them in to real things that are useful to humans like buildings, vehicles, furniture, companies, tools and so on. Consumable items, fuel etc. are only considered wealth until they are consumed – when they may or may not pass their value on to another asset, think fuel vs. a brick for example. Take books, they tend to devalue over time so they have some kind of residual value, also items that are well-engineered and built to last benefit the environment and save on resources that are ultimately in finite supply. Frugality and quality is good for the environment and maybe your mental health, consuming non-recyclable goods is bad. Hopefully that has given you a brief simplistic view of real wealth creation that will act as a foundation to my next and most important point about money. Now on to money. To be successful money must have various features but to make the point about Bitcoin’s importance we need understand only two. Unit of account and divisibility. Imagine I have a chicken that lays eggs, I sell my eggs for 20 cents each. Imagine you have a cow that you’re going to sell for meat at $5 a kilo. Unit of account just means that a monetary unit, dollars and cents in this case, can be used to allocate a unit value to eggs or meat. Now imagine thousands of people like us producing all sorts of other products. You see? Just how complex a barter system would actually be without the amazing innovation of money. Divisibility is just the ability for the money to be split into smaller units, this is important when we come to Bitcoin. Now I’ve used dollars and cents to make my point. But we’ll turn to gold and silver. Gold and silver have been selected again and again by different human civilisations because they have stable value, real intrinsic value (they have manufacturing uses) and they are in limited supply (hence the stable value). To use gold and silver as money you simply make small measured amounts of it (coins) – gold for higher denomination and silver for lower. That’s commodity money, it’s simple, you see? It’s also outlawed by all nation states using “legal tender” laws, how can that be? Now this is where it gets a bit scammy. I’m an atheist but there’s good reason usury is outlawed in the bible, humans as far as we know are not any smarter now than we were then, all that changed is science freed our minds from religion and brought us modern technology. It’s unwise to assume that people from that age did not understand all that could go wrong with money. So here’s where it gets interesting. Because there are always thieving mofos who don’t like to work and would rather steal your gold and silver, security became an issue, so banks were created. This is a place where you can leave your gold and silver safe and get a receipt for it, that receipt was called a “bank note” no less. Bankers soon worked out that nobody ever comes for all the gold and silver at once, so they decide to start issuing more bank notes than they have gold and silver reserves for. Now considering that they were also lending out bank notes and charging interest on them, interest on bank notes that we created without asset backing, interest on bits of paper basically, they were literally making money for nothing – obviously a complete fraud. Of course the authorities soon found out about this, the police were called, they discovered the fraud and everyone concerned was put in jail for a very long time and everyone else lived happily ever after. this fraud is the foundation of the current modern banking system, and governments can borrow this “fiat” money at interest as well as just print more whenever they want. So what could possibly go wrong? It’s a massive cynical fraudulent stealth taxation system of horrific proportions and we’re all being screwed by it. This is not even a new idea. Many monarchies used debasement (a similar process) to fund wars, sounds familiar? Imagine being able to email any amount of cash to someone without linking personal information to your email address, that’s Bitcoin. How it works and how it evolved is a fascinating story that I’ll return to in another article. What you must realise is that the “Overton window” on money has been shifted so far that you now believe something that is fake is real. 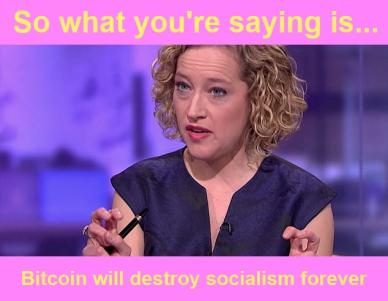 There is even a whole herd of academics backing up this fraud, they are called Keynesian economists, they behave a little like those “academics” who deny science and suggest gender is fluid, you can even get some of them to switch to full SJW trigger mode by repeatedly whispering bitcoin in their ears. For those who don’t know, Charlie Munger is Warren Buffet’s side kick. 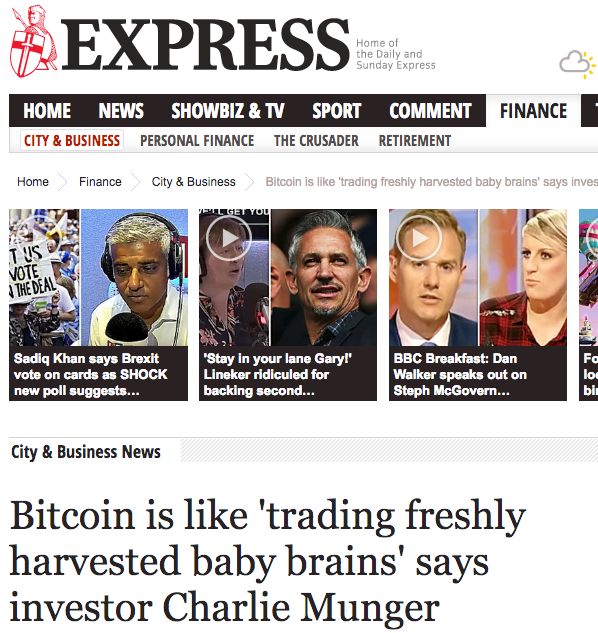 One has to question the character of someone who makes a joke about “babies’ brains” but it’s quite typical for Bitcoin. It’s a kind of Bitcoin derangement syndrome. Bitcoin is an alternative to fiat money, it’s impossible to make fractional reserve banking with Bitcoin, that’s why governments are so freaked out by it. You’ll notice they’re throwing all the insults they can at it, however Bitcoin is the Trump of money, it’s rude but effective. What you won’t see is your government explaining what I’ve explained to you in this article. Funny that, you’d have thought something that’s so corrosive would be critical curriculum in school but no. Forcibly removing the money supply monopoly from the nation state and handing it to the people is a very big deal, a game changer, and it can’t be stopped any more than you can stop people drinking alcohol. Furthermore, there is zero moral argument against it, if the authorities try and make one they will just further undermine their own credibility, and as we all know that’s already at an all time low.